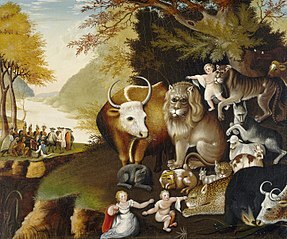 Edward Hicks: Peacable Kingdom (1826). Ken, ALBALA: “Jacob Boehme and the foundations of a vegetarian food ideology,” Petits Propos Culinaires 76 (2004): 20-29. Anita, GUERRINI: “A diet for a sensitive soul: vegetarianism in eighteenth-century Britain,” Eighteenth century life 23 (1999): 34-42. Alan, RUDRUM: “Ethical vegetarianism in seventeenth-century Britain: its roots in sixteenth-century European theological debate,” Seventeenth Century 18 (2003): 76-92. Kerry S., WALTERS: Ethical Vegetarianism from Pythagoras to Peter Singer, State University of New York Press: 1999.